Manchester United are reportedly ready to join the running for the transfer of Bayern Munich and Real Madrid misfit James Rodriguez. 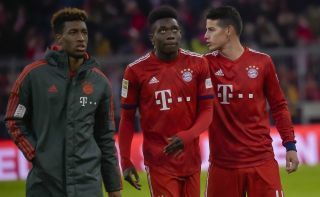 The Colombia international is nearing the end of his two-year loan at Bayern from Real, and his future has been the subject of much speculation for some time now. The latest from Don Balon is that Man Utd are interested in Rodriguez in a potential double deal to bolster their attack, alongside Philippe Coutinho for a combined £129million. It might be a tad ambitious getting both, but United have shown down the years that they have money to spend and are prepared to challenge for the world’s biggest names. And despite Rodriguez not looking at his best for some time, there’s no doubt that on his day he has the raw talent to shine for a top club, given the right tactical system. The 27-year-old could well be a good fit for Ole Gunnar Solskjaer’s attack-minded Red Devils side, with the Norwegian tactician showing in a short space of time how much he can improve players struggling with confidence, with Paul Pogba perhaps the best example of a player who’s gone up a level very quickly under his guidance. Don Balon also recently linked Rodriguez as a target for Liverpool and Arsenal as he looks set to be made available this summer. Both those clubs will also want to improve in attack to ensure they can be in the title running next season, so if United can win the race for his signature it could go a long way towards deciding the performances of those teams in the 2019/20 battle for top spot or at least the top four.